Demetris Robertson will return to UGA with his family in tow for the Missouri game. 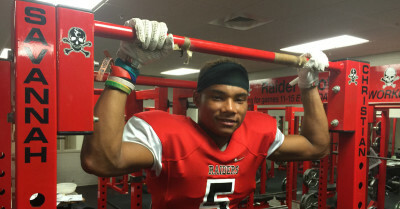 Savannah, Ga. — UGA priority recruiting target Demetris Robertson was not at the Southern game on Saturday as previously planned. The nation’s No. 2 athlete told the AJC’s DawgNation his family now plans to make a trip to the Missouri game on Oct. 17. “It will be better my if twin sister and my mom can do it at the same time,” he said. That crucial unofficial visit should play a large part in whether or not the 4-star prospect stays in state to play for UGA. There’s the possibility his twin sister could join him at UGA. Shanetris Robertson runs track, but also has an impeccable academic transcript. She took extra classes and graduated early from Dawson Christian in Newnan as the Valedictorian of her class. It appears the best way that the Bulldogs can wow Robertson and his family on that visit will be to focus on academics. Robertson seems convinced the football part of the equation at UGA will work out nicely. He’s interested in seeing just how well the academic engines of the university can prepare him for a successful life in the business world after his playing career ends. He’s very serious about the academics that will shape his decision. That’s why Stanford is his leader and why he also visited Notre Dame. The nation’s No. 2 athlete for the Class of 2016 will not be at the Alabama game next week. Robertson will be on an official visit to Cal instead. How can UGA overtake Stanford? “For Georgia to get past Stanford it would take just me being comfortable at the school and them setting me up for the future.” Robertson said earlier this week. Georgia Tech was the first school to offer him a scholarship. He plans to make that his final official visit out of respect for the Yellow Jackets as his first offer. His official visit lineup so far is Notre Dame (already taken), Cal (this week), Stanford and Georgia Tech. That fifth official visit has yet to be determined. LSU, Northwestern and Ohio State are contenders for his fifth official visit. The Buckeyes have ratcheted up their interest in Robinson of late and see him playing in the secondary and returning kicks in their program. Robertson even said there was a possibility he might not make his college choice known on National Signing Day. Keep in mind Alabama is also a major contender for his signature on scholarship papers. He was committed to Alabama for almost a full year before he de-committed earlier this summer. Want to know exactly how Robertson feels about his recruiting process? Check out his video interview from earlier this week with DawgNation.com below.